Eucalyptus is a diverse genus of flowering trees and shrubs (including a distinct group with a multiple-stem mallee growth habit) in the myrtle family, Myrtaceae. Members of the genus dominate the tree flora of Australia. There are more than 700 species of eucalyptus, mostly native to Australia, and a very small number are found in adjacent areas of New Guinea and Indonesia. One species, Eucalyptus deglupta, ranges as far north as the Philippines. Only fifteen species occur outside Australia, with just nine of these not occurring in Australia. Species of eucalyptus are cultivated widely in the tropical and temperate world, including the Americas, Europe, Africa, the Mediterranean Basin, the Middle East, China and the Indian Subcontinent, though most species do not tolerate frost. Eucalyptus is one of three similar genera that are commonly referred to as "eucalypts", the others being Corymbia and Angophora. Many species, but far from all, are known as gum trees because they exude copious sap from any break in the bark (e.g., scribbly gum). The generic name is derived from the Greek words ευ (eu) "well" and κάλυπτος (kályptos) "covered", referring to the operculum on the calyx that initially conceals the flower. 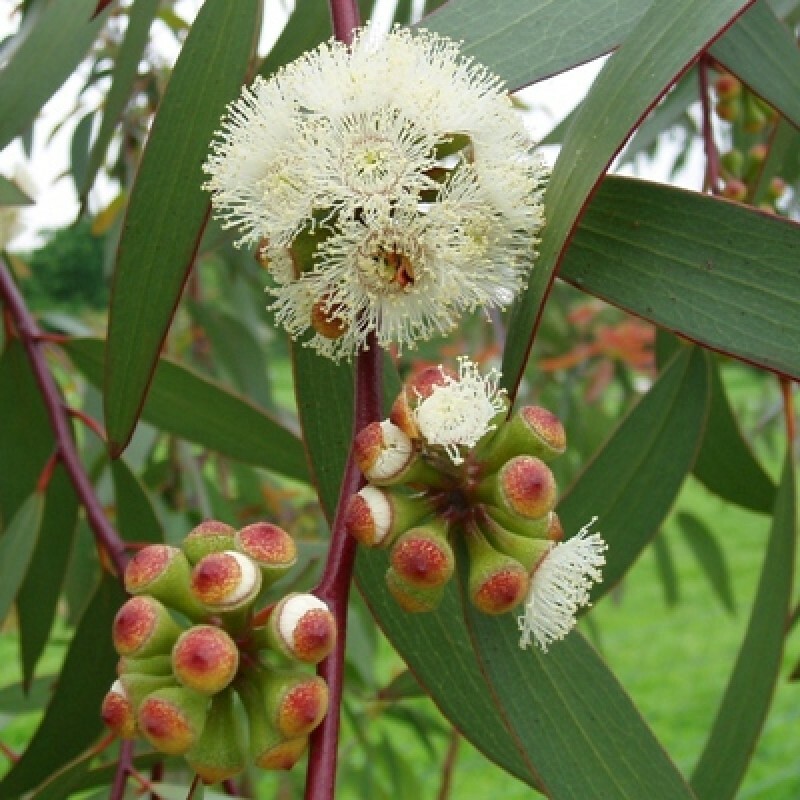 Some eucalyptus species have attracted attention from horticulturists, global development researchers and environmentalists because of desirable traits such as being fast-growing sources of wood, producing oil that can be used for cleaning and as a natural insecticide, or an ability to be used to drain swamps and thereby reduce the risk of malaria. Outside their natural ranges, eucalypts are both lauded for their beneficial economic impact on poor populations and criticised for being "water-guzzling" aliens, leading to controversy over their total impact. On warm days eucalyptus forests are sometimes shrouded in a smog-like mist of vaporised volatile organic compounds (terpenoids); the Australian Blue Mountains take their name from the haze. Nearly all eucalyptus are evergreen but some tropical species lose their leaves at the end of the dry season. As in other members of the myrtle family, eucalyptus leaves are covered with oil glands. The copious oils produced are an important feature of the genus. Although mature Eucalyptus trees are usually towering and fully leafed, their shade is characteristically patchy because the leaves usually hang downwards. The leaves on a mature eucalyptus plant are commonly lanceolate, petiolate, apparently alternate and waxy or glossy green. In contrast, the leaves of seedlings are often opposite, sessile and glaucous. But there are many exceptions to this pattern. Many species such as E. melanophloia and E. setosa retain the juvenile leaf form even when the plant is reproductively mature. Some species, such as E. macrocarpa, E. rhodantha and E. crucis, are sought-after ornamentals due to this lifelong juvenile leaf form. A few species, such as E. petraea, E. dundasii and E. lansdowneana, have shiny green leaves throughout their life cycle. E. caesia exhibits the opposite pattern of leaf development to most eucalyptus, with shiny green leaves in the seedling stage and dull, glaucous leaves in mature crowns. The contrast between juvenile and adult leaf phases is valuable in field identification. Four leaf phases are recognised in the development of a eucalyptus plant: the ‘seedling’, ‘juvenile’, ‘intermediate’ and ‘adult’ phases. However there is no definite transitional point between the phases. The intermediate phase, when the largest leaves are often formed, links the juvenile and adult phases.